Scotland’s population is around 5.3 million by the way. Now, I’m not suggesting for one moment that the North of England – or any part of the North of England for that matter – should break away from the United Kingdom. I mean, for a start, we wouldn’t have won quite as many medals in the Olympics. 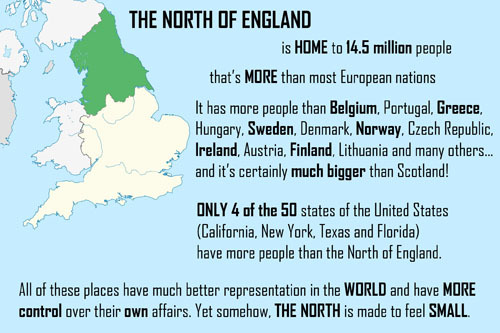 However, the three regions that make up the north – and not just the cities – do need a stronger and bigger voice that’s in keeping with their place in the world. In fact part of the problem is that they need to have a place in the world. Too often they’re seen as the fringes of England. They’re more than that, in fact in many ways they are the real England. Yet somehow, somewhere along the line, we’ve been conditioned to think small and the truth is we are very far from that. We have our own distinct history and a population that many nations in the world don’t come close too. The North has a story all of its own – and it’s a big story and with deep roots. Whenever we think about the North, we need to remember to think big and ensure that we get our fair share of investment and a bigger say in our affairs. Great Britain is not just all about London. 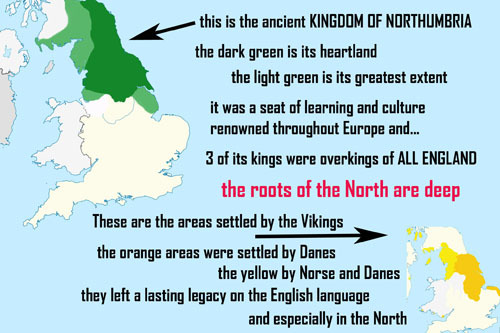 Without the North, it would be Not So Great Britain. 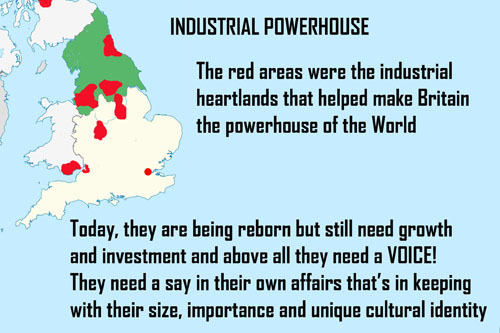 So, always speak up for the NORTH and let’s start by making sure that we are properly empowered to do so. 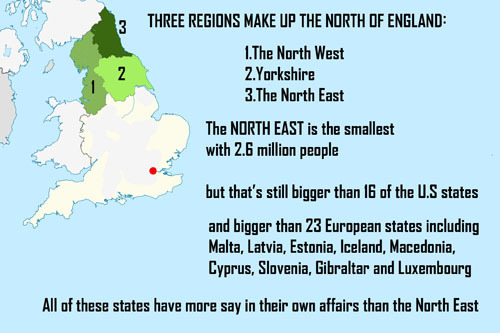 I think England should have devolution, but as people say – it’s too big to be ruled as one unit and the regions have big differences too. English Votes for English Matters is pathetic really, it still treats England like a “rump UK”. I think a better solution would be to give Scotland, Wales and Northern Ireland full parliament’s with powers similar to Canadian provinces. Then England could have regional assemblies with weaker powers similar to Canadian territories with other powers still retained by the UK government with the “English Votes on English Matters” meaning only English MPs could vote on matters relating only to the English regions. The UK government would also retain powers over things like defense and foreign policy for the whole of the UK.